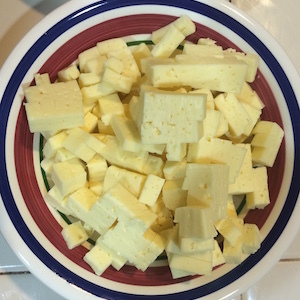 Cube the cheese into small (1/4 inch) cubes. 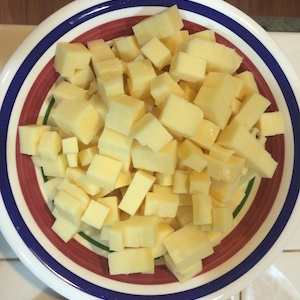 The amount of cheese may be increased if you like extra cheese but be careful to not overdo it. Thinly slice the onions. It is best if they are cut in half first such that you don't have loops, albeit it does not make a big difference. In a large, deep pot fill it 3/4 full of water, add a teaspoon of salt and a teaspoon of butter or cooking oil. Put this on a burner and let it come to a boil. Heat a heavy skillet (I prefer cast iron) on a burner to hot. Add a bit of peanut oil, just enough to coat it. Put in the onions, spreading them around. We want to brown the onions. Do not add anything to the onions. 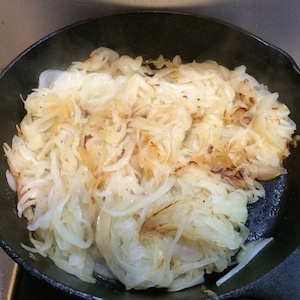 Do not brown too dark but make sure all onions are browned. While the onions are browning and the water is heating up, prepare the dough. Put the flour (I use unbleached white whole wheat flour) into a large bowl. Whip up the eggs and incorporate them plus a cup of water into the flour. Add a teaspoon of salt. If flour is not completely incorporated, add water. I many times end up needing an extra 1/3 cup of water, but it depends on the weather and the size of the eggs. 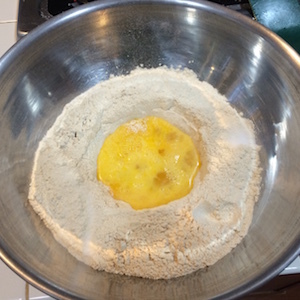 The thickness of the dough depends on the manner of making the spätzle. I use a traditional Austrian spätzle making apparatus and thus need the dough to be a bit thinner than that of bread dough as it must "fall" through the holes into the boiling water. Once the spätzle start to float, use a slotted spoon to remove them from the water and layer them into a casserole dish. 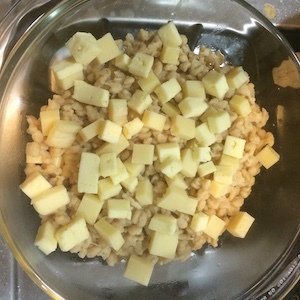 You will alternate layers starting with spätzle, then cheese (some of each of the cheeses), then more spätzle, etc. Continue until the casserole is almost completely full. 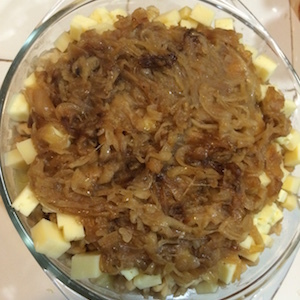 On top of the mostly full casserole of spätzle and cheese, put the browned onions, covering the whole top of the casserole. 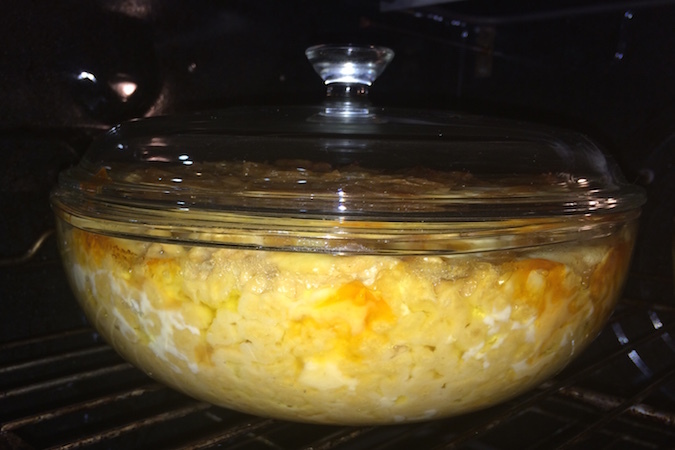 Cover the casserole with a lid (or, if you don't have a lid, use aluminum foil to cover it). Place it in a 350 degree pre-heated oven for around 25 to 30 minutes - until the cheese has fully melted and is bubbling. This is needed to get the flavors to really integrate. Käsknöpfle has been a favorite of mine since childhood, especially after a long day outside skiing or otherwise playing or working in the snow. Every time I have it, it brings back wonderful memories of winter, snow, and skiing.